I got a little tired of stitching with all that green, so I decided to take a little break from "The Riddle" for a day or two. I ended up starting the new Loose Feathers by Blackbird Designs "It's Berry Time." 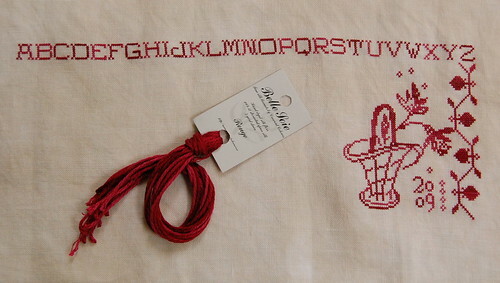 I'm using Rouge Belle Soie silk and stitching it on 40 ct. Vintage Maritime White by Lakeside Linens. 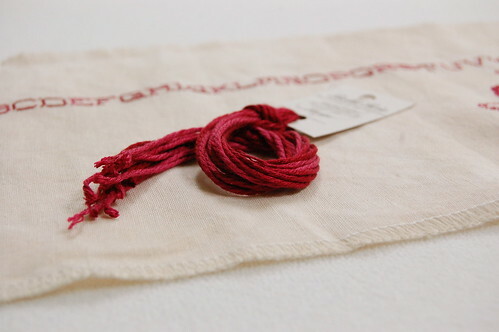 I love the color of this silk - it has shades of red, fuchsia and pink. As for this chart, I just don't care for it. I think the baskets look sort of "wonky"--not sure entirely what I dislike about them! It sure is popular, though. I'm seeing quite a buzz around it. I think it's great that there's at least SOMETHING out there that doesn't need to be added to my wishlist, lol! i really like that color. i am thinking about brown's and blues for this piece. Beautiful start Nicole...love the color you chose. You stitch so fast! That is a beautiful color, Nicole. I didn't join the Loose Feathers club this year, but this one has caught my eye, especially now that I've seen your stitching on this. It looks like you've gotten a lot accomplished in a short time - flying needles! I love that red!!!!! This is going to be another beautiful piece!!! Very pretty! I love the silk you are using for it. I love the red thread you are using, it's so pretty. Your Loose Feathers start Berry time is going to be very pretty, I love the floss color you chose. That's a beautiful red! love it! Yummy - don't you just love stitching with the Bella Soie silks! They have to be one of my favorite silks. Beautiful start! Great start, love the color ! Oh how pretty this is!! Red is my favorte color anyhow and having some fushia and pinks makes it that much prettier!! Your stitching looks really pretty!! Outstanding start!! I love Belle Soie Silks, use it alot. It is nice to switch things up a bit! Amazing how far you got today!! Keep it up :). I love those colors!~ I am thinking I am going to put this one on my to do list....ANOTHER one of yours!~ You have tempted me yet again!~ Nice work Nicole...Hope to see you soon! That looks like a delicious color! Your needles are always flying Nicole! Beautiful start! A gorgeous colour for a gorgeous design and a great start! PS Nicole, be careful of the reds of Belle Soie...they really bleed! That is so very pretty! I can't wait to see more. I love BS. It's my favorite silk. Oh Nicole, I'm soooo in love with that one. All that red, it's going to be another beauty. This looks great, cant wait to get mine in the mail. I miss stitching in red, lol. What a beautiful design. Looking great! Lovely start. And a great colour! I love that color and fabric. Beautiful WIP. This is a beautiful design and a great start! The colour of thread is great.